Bronaugh Apartments is centrally located in downtown Portland. Offering studio and one bedroom floor plans, this building is convenient to shopping, Pioneer Square, PSU and all the amenities downtown has to offer. This building has HUD subsidized units. Learn more about subsidized units. 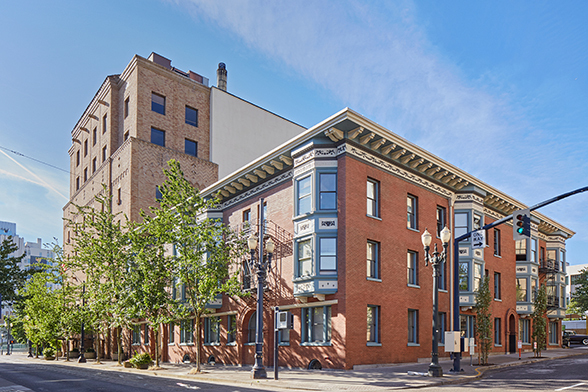 Originally built in 1905, the Bronaugh is listed on the historic registry and is one of the oldest remaining apartment buildings in Portland. The building features original architectural details such as semi-circular arched openings, bracketed and broad overhanging eaves, decorative egg anddart moulding, and ornamented frieze and bay window panels, each contributing to the building’s unique eclecticism. • Easy access to Max Red and Blue Lines and Bus Lines 15,18,20,51. Ranked a “walker’s Paradise”with a WalkScore of 98.